My killer food is the Chinese Buffets of which there are four close by that serve a delicious variety of Oriental Delights, especially my favorite: seafood. One in particular, Chop Stix in Summit Parkway off Loop 410 West has shrimp, boiled, fried, sautéed and with veggies, wrapped in bacon, sushi and in casserole. I go there once a month. First off, good job on limiting the killer food by frequenting Chinese Buffets only once a month! I also recommend limiting the number of choices at a buffet to 2-3. 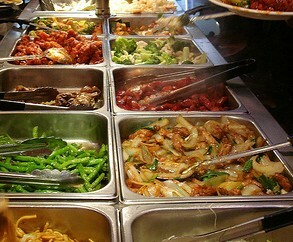 Survey the whole buffet first and decide on 2 or 3 of the most delicious things you want to eat. If I'm ever in San Antonio, I'll have to "research" this Chop Stix! Enjoy! It's all about portion control, right?